[By Nick] Let me just get this out of the way, I am not a fan of drinking coffee. Sure I'll have an iced coffee every now and again but it's just not my cup of tea. However, as of late I've acquired a growing affection for it in frozen desserts. Be it Stonyfield’s Gotta Have Java frozen yogurt, Ben & Jerry's Coffee Heath Bar, or even Almond Dream’s Cappuccino Swirl, something about it keeps me coming back for more. 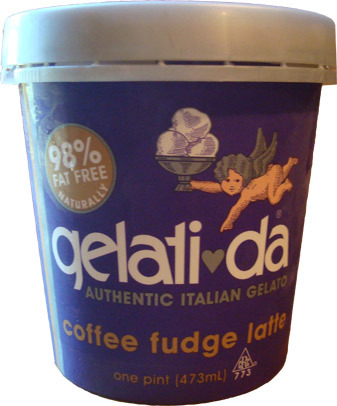 This led me to pick up two different coffee related pints from ice cream source, one of them being today's review, Gelati-da's Coffee Fudge Latte. The description from their website says “A smooth blend of Columbian arabica coffees with ribbons of rich, no-fat fudge variegate... coffee ice cream lovers will shout 'bravissimo'!”. Now not being a coffee drinker, I have no idea what the differences between coffee beans are, but I can only assume they’re using high quality stuff. Also if you’re like me you have no clue what variegate means. After a quick google search I’ve gained the knowledge that it means to diversify in external appearance especially with different colors. So you’re telling me that fudge isn’t the same color as coffee? Blasphemy! Lastly, if I don’t shout bravissimo, do I get a refund? Okay time to get serious and let’s crack open this pint. Now that’s a pretty sight. The swirl of fudge definitely adds some contrast to the colors ( aka variegate ;] ) I’m going to break this up into two parts. First let’s talk about the coffee base. Like I assumed earlier this is indeed some quality stuff. The coffee flavor isn’t dominate by any means. It’s very smooth and mellow yet remains delicate with a bit of acidity on the back end. The base would make for an awesome pint on its own but the fudge swirl takes it up a couple of notches. Now when they say fudge they’re not kidding. Normally you’d find something among the line of syrup in texture but this is decently thick and gooey. The taste isn’t your run of the mill fudge either. The complexity of the cocoa only helps highlight the subtle notes of the coffee and when together make for a combination rivaling that of chocolate and peanut butter. My only complaint is that the fudge wasn’t evenly disburse throughout the pint. It’s not that much of a problem though when the base can hold its own like this one can. 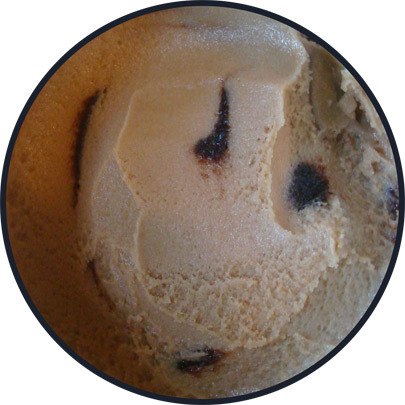 The texture of this gelato only continued to enhance the experience. It was icy yet remained creamy, almost in a premium frozen yogurt kind of way. Actually the more I think about it, the more it reminds me of a blended coffee drink, just a lot denser and less sickly sweet. This is everything a coffee dessert strives to be. Lastly the nutritional info of this gelato is beyond impressive. It’s 98% fat free with only 2 grams of fat total and 130 calories per serving. 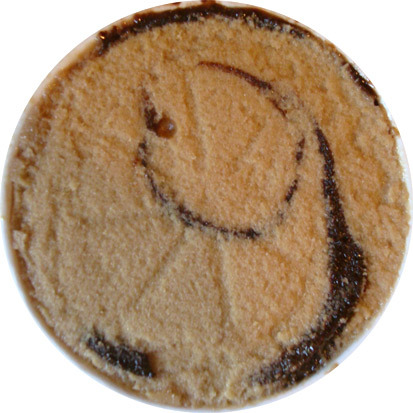 Compared to Ciao Bella’s Triple Espresso, which has 13 grams of fat and 210 calories, it’s beyond a knockout. I mean come on there’s less fat in the whole pint then there is in one serving of Ciao Bella’s gelato, which doesn’t even have any add ins. To sum it all up, this stuff is by far my new favorite when it comes to coffee desserts and has all but converted me into being a coffee lover. Though I can’t say I shouted bravissimo, I’m pretty sure my taste buds might have. Sounds delicious, im also not a huge fan of coffee but love it in ice cream/some chocolates etc..guess i just dont like it in its pure form haha!